Notwithstanding Naveen Patnaik’s categorical assurance for his party’s support to PA Sangma, some of the BJD legislators in Balasore district are learnt to be hobnobbing with Congress leaders to cross vote in the ensuing presidential election. With the race to Raisina Hill inching closer, it seems the efforts of BJD supremo and Odisha Chief Minister Naveen Patnaik to keep his flock together is failing. Notwithstanding Naveen’s categorical assurance for his party’s support to P A Sangma, some of the BJD legislators in Balasore district who are purportedly under scanner having alliance with desecrated Biju Janata Dal (BJD) Rajya Sabha MP Pyari Mohan Mohapatra, are learnt to be hobnobbing with Congress leaders to cross votes in the ensuing presidential election. Sources said two senior Congress leaders from neighbouring West Bengal who are close to Pranab Mukherjee had secret parleys with the representatives of three BJD legislators at a private hotel on Monday night to finalise the ‘deal’ in lieu of their support to the candidature of Mukherjee. Congress high command is learnt to have given tacit approval to the move without engaging the Congress functionaries here ostensively to fortify the chances of win of Mukherjee by purchasing on allurement the votes of these BJD MLAs on whose head hangs the Damocles’ sword for allying with Pyari. Although the hotel management and BJD leaders declined to offer any comment on this score, it is understood that the talks is centered around largely on presidential election and congress leaders have been successful in obtaining the assurance of these BJD leaders to support Mukherjee through their respective intermediaries. With a view to hide and keep the meeting a top guarded secret, four rooms were booked in the name of a pharmaceutical company, but evidently, the Congress leaders occupied the rooms to accomplish the mission without establishing their identity to the hotel management. Despite a clear-cut instruction from the Ministry of Home Affairs (MHA) as a part of standard operating procedure (SOP) to establish the identity of the occupants by allowing them to enter inside the rooms, the hotel management deliberately undermined the SOP for the reasons best known to them. The intelligence sources though confirmed it, but refused to divulge details taking the seriousness and its political ramifications into count. 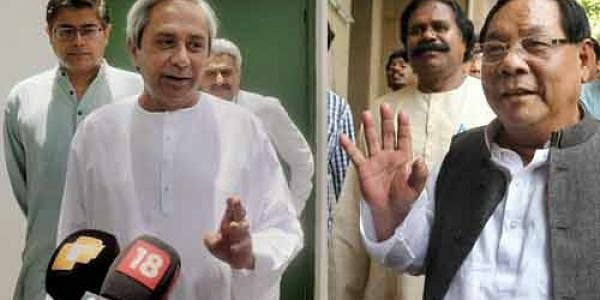 Indeed, it is a matter of concern for Naveen and definitely has the potency to add to his worries. There is no iota of doubt that the leaders from Balasore who had gone to the extent of dethroning Naveen in the recent past can resort to any such devious anti-party activity knowingly its consequence at the cost of their political future in BJD. If the deal worked out, it is a matter of time when these leaders will way their options to turn their coats to Congress because they are aware of the fact that their days in BJD are numbered. Meanwhile, Naveen is required to keep his flock together and ensure that all his legislators obey his diktat by throwing his arm into the wind in regard for ensuring the success of Sangma. If Naveen fails to do that, his stature and standing in the national politics will have a serious drubbing.